Today I had intervals on the schedule--my favorite! (Just kidding, I hate them). I actually prefer doing intervals on the treadmill rather than the street or a track, because I can just set the pace and suffer through it without putting much thought into it. Since I got my new Garmin, however, I wasn't sure about doing intervals on the treadmill. The Garmin wasn't very accurate the last time I used it, and intervals aren't really the best time to test it out. Rather than setting up the Garmin to do quarter-mile intervals automatically, I decided just to manually push the lap button every quarter mile (distance according to the treadmill). There really wasn't any point to wearing the Garmin other than for my heart rate and to test it out and see how well it worked on the treadmill. My plan was to do 12 x 400 at about a 7:00/mi pace. (Basically, that means I would run a quarter mile at a 7:00/mi pace, then jog a quarter mile slowly, and repeat for a total of 12 times.) I started the treadmill, and started my Garmin, and started with a jog segment to warm up a little. Then, just before the treadmill read 0.25 miles, I hit the lap button on my Garmin and bumped the speed up to 8.6 mph (a 6:58/mi pace). I ran that until the treadmill read 0.5 miles, then I lowered the speed to 6.2 (a 9:40/mi pace). That first interval made me realize that I am not in the same shape I was in February! It was HARD. I used to do my 400's at 9.3 mph (about a 6:30 mile pace, I think). 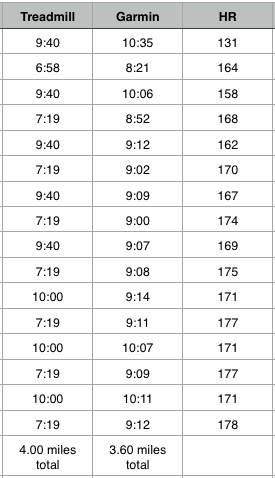 That wasn't going to happen today, and I decided to reduce my fast intervals to a 7:19/mi pace (8.2 mph) after that. I kept repeating the intervals, hitting the lap button every quarter mile. About four intervals in, I thought there was NO way I was going to be able to do 12! Since this workout was from the Hansons' Marathon Method, it really wasn't necessary to do that many for half-marathon training. For marathon training, they recommend three miles worth of fast speed work (which is where the 12 comes from--12 quarter-miles is 3 miles total). Maybe I was just looking for an excuse to quit early, but I decided to go back to doing 2 miles worth of speed (8 hard quarter-mile intervals). That's what I used to do last winter, and it worked out well. After my sixth interval, I got nauseous, and truly thought I was going to puke. I ended up slowing the recovery jog to a 10:00/mi pace instead of 9:40. I was dying to walk, but I wanted to stay as consistent as possible for the sake of testing out my Garmin (which I could already see was failing miserably!). My stomach was getting really queasy, and I couldn't wait to be done. After the eighth interval, I stopped the treadmill and went over to the kitchen sink. I hung over the sink for a couple of minutes, thinking I was going to puke, but the nausea passed. After a couple of minutes, I realized I'd forgotten to stop my Garmin (dammit!) after the last interval. Thankfully, I noticed it after 2 minutes rather than 20. The first two columns are the paces shown, on the treadmill and on the Garmin. The third column shows my average heart rate. For reference, on an easy run, my heart rate is usually about 150. Today's intervals had my heart rate get up as high as 98% of my maximum! Ain't no way that was done with a 9:00-something mile, like the Garmin showed. I'm going to give the Garmin another shot when I'm NOT doing intervals, but it looks like I'm going to have to continue to use the foot pod for accuracy. The foot pod is extremely accurate, as tested on a 400-meter track. After I nearly puked from my interval run, I went in the bathroom to take a shower, and Paolo ran in there, hopped in the tub, and started meowing for me to turn on the water. He's gotten SO spoiled with the running water, and now he doesn't like to drink out of his bowl. So after I took a shower, I decided to go buy him an early Christmas present--a water fountain for pets. I picked up the boys from school, because they had a half-day, and we went to PetSmart. The ones that I really liked (ceramic or silver) were over $100! So I chose a large plastic one. They had small ones that were cheaper, but with four cats, I think it's safe to say we needed a large one. As soon as we got home, I set up the fountain, and Paolo was in love. He wouldn't leave! It was like he was worried I was going to turn it off as soon as he walked away. He is one very happy cat right now. While I was at PetSmart, I saw these bedding pads that I thought would be good to put on the new couch so the cats are more attracted to those than the leather. They're called "Mysterious Purr Padds"--I'm not sure what the mystery is, but they looked like something the cats would like, and I was right. This picture is completely shocking, because Estelle HATES Paolo with a passion. She's always looking for reasons to swat at him and start fights. If she's lying on my bed (which is a queen sized bed) and Paolo jumps up there, even on the other side, she'll go hit him and then run into the living room. She just can't stand to be near him. There were two pads in the box, and Paolo claimed this one, while Chandler claimed the other. Chandler is so big that there wasn't room for Estelle, so Estelle actually chose to sleep next to Paolo. I painted my nail bed! Now it looks like I have a toe nail. I was 136.5, which means I'm down 1.5 pounds from last week. I'm very happy with that! I've always weighed myself daily (or nearly every day), and this week, my weight was climbing all week long. I was 100% on track all week, but my weight went from 138 to 138.5, 139, 139.5, 140... and then 137 the next day, and 136.5 today. It was frustrating, because I knew I was doing everything right. But I've been doing this so long that I know when to get concerned about "real" gain vs. water gain, and this was definitely water gain. I'm just glad it came off before my "official" weigh in today. I had a good week, so I'm hoping to continue on! I see you've painted toe 'nail'! Your cats are too funny, and cute :). I'm training for a 70.3 distance triathlon and trying to become a better runner (my weakest area.) My plan incorporates sprint intervals every Wednesday, so I run at a local high school track. Intervals are no joke! I almost lost my breakfast right on the track. Luckily I kept my breakfast and my dignity in tact. :) Happy Thanksgiving to you and your family! How funny, I love the water fountain. I've been thinking of getting one for Johnny too. He loves running water. I'll have to look into those pet pads for the furniture. Right now I keep a fleece blanket over the one chair he always likes to sit in. Treadmill torture ... I need to get back to that soon too! My cat used to sleep in the bathroom sink, so he wouldn't miss an opportunity for a fresh drink - I was wondering about the intervals and honestly thought that 6 miles was ALOT... I know that I would have been to the kitchen sink much sooner than you... You are FAST!! Happy Thanksgiving!! I am glad that you are staying on track with your maintenance. It seems like your regular life, not a chore... I hope the same for me one day!! I have the same water dish for my cats, they love it but a warning when the water gets low it gets LOUD! Super disappointed about the Garmin. :( I have ordered the same one finally! Mine came through an employee so I was unable to order for a while. I hope it comes soon, but so far it hasn't shipped. I was hoping to wear it for my 15K in 2 weeks. I wish it would work better on the treadmill cause I like to do short runs at the gym.